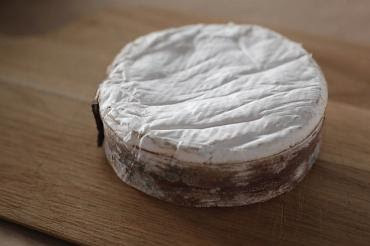 Janet Fletcher: Like many American artisan cheeses, Harbison, a bloomy-rind disk wrapped with a strip of spruce bark, evolved from an experiment. Jasper Hill fans will recognize it as the love child of Moses Sleeper, the creamery's Camembert-style cheese, and Winnimere, its bark-wrapped washed-rind wheel. The experimental cheese became runny when ripe; girdling it with the spruce band helped contain the interior and imparted a woodsy scent. "We knew we were on to something tasty," says Mateo Kehler, Jasper Hill's cheese maker. Jasper Hill harvests the paper-thin strips of bark in the spring from white spruce and dries them. As needed, the bark strips are boiled to sterilize and soften them, so they will bend around the day-old wheels. Over the four-week maturation at the creamery, the wheels develop a powdery-white cloak of mold. By the time they reach Bay Area cheese counters, the 10-ounce wheels should be supple inside, spreadable like frosting. At peak ripeness, which occurs at about 60 days, the cheese will be so soft that you can slice off the top and scoop out the interior with a spoon. If you want to experience Harbison at optimum ripeness and it isn't there yet, Kehler suggests putting the cheese in the refrigerator for a couple of weeks. Keep it in a lidded plastic container and monitor it often, turning the wheel over every couple of days. When it gives readily to pressure, bring it fully to room temperature before serving. "The texture should be ooey-gooey," Kehler says.